What spire is that? That of Sacred Heart Church. On Tuesday, who had memories of playing as a kid at Dunne Park again? Perhaps you were recalling yourself flying high on the swings or splashing in the wading pool, rolling down that slight slope from Sixth Street, hitting tennis balls or chasing them down, catching a fly ball or rounding the bases, or. . .? 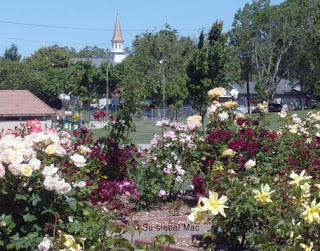 That's where this week's Tuesday in Hollister should've brought you: Dunne Park! Dunne Park was named after James F. Dunne, a well-known rancher who died in 1925. 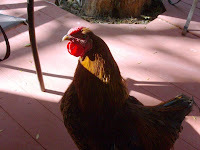 His ranch was on San Felipe Road, just north of Dunneville Corners, where Shore and San Felipe Roads meet. Dunne's widow, Viola, who died in 1930, willed $75,000 to the city of Hollister to build a memorial auditorium. How did the auditorium become a park instead? Anyone know? The beautiful rose beds that have been at the park since I can recall is described as being a memorial rose garden. I always wondered who we should be remembering. Perhaps it is for James F. Dunne. Dunne Park was dedicated in 1941, according to "The Historic Downtown Walking Tour" pamphlet (by the San Benito County Historical Society, I believe). Before the grounds on Seventh and West streets became the downtown community park, Sacred Heart Church was located there. Anyone have photos of the church there? Recently, the Hollister Youth Alliance received a $100,000 grant to develop a plan for restoring Dunne Park that would increase its use. For more details, read the article Restoring a Neighborhood Treasure at the Weekend Pinnacle Online. Okay, one more look at Dunne Park. This was taken during the "Music in the Park" concert last month. Click on it for a larger view. "Let's Stirrup Some Fun" is the theme of this year's county fair. Are you ready? 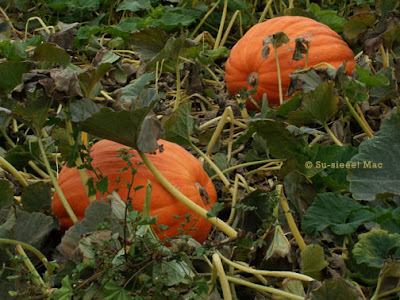 The fair opens on Friday, October 1 at 10 a.m. and closes at 7 p.m. on Sunday, October 3. Whoo-hoo! Friday is Kids Day. All kids 12 and younger get in free. Saturday is Armed Forces Day. If you're in any branch of the military, show your military ID for free entry into the fair. For more details about hours and rates, click here. And, click here for a schedule of events and performers for the whole weekend. Tuesday in Hollister: Where Are You Hanging? 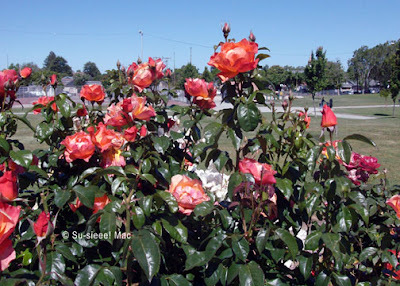 How many of you, Take 25 readers, know that Hollister has its own fragrant rose garden? Go ahead, tell the others: Where is it? And, while you're at it, tell about your fun memories of the place? What's that spire up ahead? Many of you have probably heard about the budget cuts to the Haybalers sports program at San Benito High School. Many of us would like to help, but our budgets are tight as well. So, what to do? Here's one way: Whenever you shop at Nob Hill, a percentage of each purchase can be donated to the San Benito High School athletic program. You could be buying several bags worth of groceries or just a bottle of soda pop. Here's how that could be: The high school athletic department is participating in the Quality of Life program sponsored by Raley's, of which the local Nob Hill market is part. (It is also known as the Q-Card Scrip Program.) Raley's contributes 1 percent of a shopper's monthly purchases up to $300; 2 percent for purchases between $300 to $500; 3 percent, between $500 to $600; and 4 percent on purchases over $600. As you can see, that adds up a pretty penny for the Haybaler sports program. You can use your card at any Nob Hill, Raley's, or Bel Air Market. So, how do you start becoming part of this fun? First, you need to get a Quality of Life card and then register it online at Raley's Web site. When you're at the checkout line at Nob Hill, present your card to the cashier, who in turn will swipe it into the computer. That's it. Here's how to obtain a Quality of Life card: You can pick one up at the Student Activities Office, or have your child get one for you. By contacting Becky Doty, Athletics Department Clerk, at (831) 637-5831, extension 351 or bdoty@sbhsd.k12.ca.us, you can have the card mailed to you. For more details, click here to head over to the athletic department Web site. You'll need to scroll down to the section "E Scrip for Athletics." For details about the Quality of Life program, click here. This photo is courtesy of Bradley Baxter. Thanks, Bradley. How many of you dear Take 25 readers are graduates of San Benito High School, aka Hollister High School, also once known as San Benito Joint Union High School, or attended it for some part of your high school life? 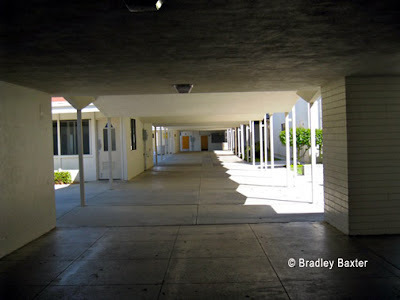 How many of you did not recognize the doorways at the high school in this week's Tuesday in Hollister? That's okay, you don't need to raise your hands. School is out. I'm sure you have a perfectly good reason for not remembering where those doors lead. 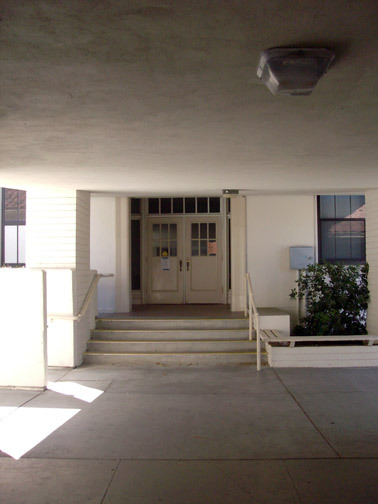 In my day, the doors in the top photo lead to the English and history classrooms on the first floor of the main building. 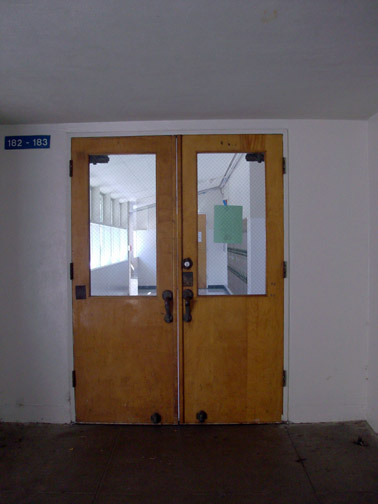 the doors in the bottom photo lead to the biology and general science classrooms. No doubt the doors open to other types of classrooms or administrative offices today. Tuesday in Hollister: Where are These Doors? Here are two sets of doors. Where are they located? Where do they lead? What stories do you have about going through them, hmm? Outstanding in Their Field: Pumpkins! After a stop at the Phil Foster farm stand this afternoon, the husband and I headed over to San Juan Bautista via the back roads. 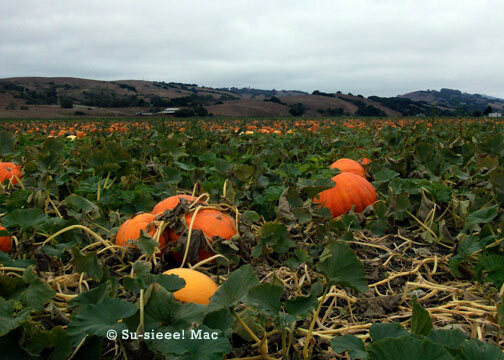 On Prescott Road, we came across a field of glorious pumpkins out "standing" in their field. Many of them were huge! Coming Up: Hey Lady! Want to Drive a Model A? 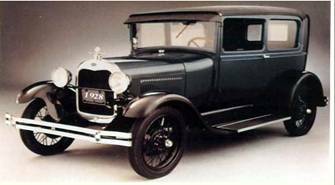 How would you like to drive a Ford Model A, and have a donation made on your behalf to breast cancer research? 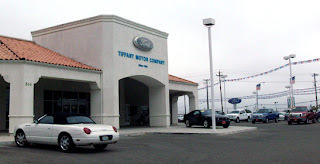 On Saturday, October 2, Tiffany Ford will host a Breast Cancer Awareness Day at its showroom at 300 Gateway Drive in Hollister, from 9 a.m. to 12 noon. The event will involve participants completing a lesson to learn how to drive a Model A. This includes hands-on instruction on restored Model As. The instructors will be Vicki Wildman and other members of the Santa Clara Valley Chapter of the Model A Ford Club of America. Every participant who completes the class will receive a driving certificate, a patch, and a Ford's "Warriors in Pink" bandanna. In addition, Tiffany Ford will make a donation to the local Hope for a Cure Memorial Educational Scholarship Fund or to the Susan G. Komen Breast Cancer Foundation. The cost of the event? Only $5.00, which is a registration fee. According to Jade Sandifer, one of the event organizers, 25 Model As will be on hand. There will be a cut-off number, so if you're interested, it's best to register soon. 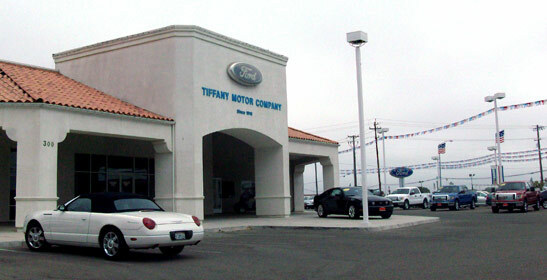 You can call Jade at (831) 637-4461 or email her at jades @ tiffany-ford.com. For more details about the event, head over to this page at Tiffany Ford and scroll all the way to the bottom. This event is one of several that Tiffany Ford has sponsored this year to celebrate its 100th Anniversary. The business is the oldest Ford dealership in California. Amazing! How many of you, Take 25 readers, have purchased a car from Tiffany? Want to know more about the organizations mentioned today? How did you do with this week's Tuesday in Hollister? Did you figure correctly as two commenters did? "Monterey and 6th. 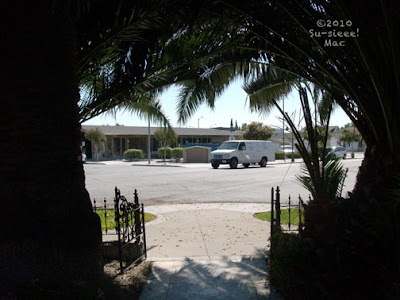 Grace Bible Church seen kitty-corner where Wells Fargo used to be," wrote Cindy at Facebook. "Hint: sounds like the name of a large type of steak," stated Anonymous at the original post. I was standing at the Porter House on the northwest corner of Monterey and Sixth Streets. This Queen Ann style house was built around 1880. It is no longer a residence. It has been divided into office suites and today rents out to several local business people and to the Redevelopment Agency. My favorite aspects about the house is its wrap-around front porch and the cute tower where I wouldn't mind having my office. The "Porter" in Porter House refers to one of the first, if not original, residents of the house, Dr. George and Olive Pond Porter. 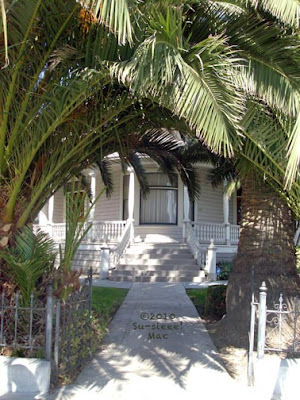 Dr. Porter immigrated from England in 1873, eventually settling in Hollister in the 1880s. A druggist, Dr. Porter and brother-in-law Hiram Pond were co-owners of a drugstore in town. Porter went back to school to earn his medical degree and obtained his medical license in 1890. He returned to Hollister and more than likely practiced medicine. Dr. Porter died in 1905. Here's a link to his obituary. 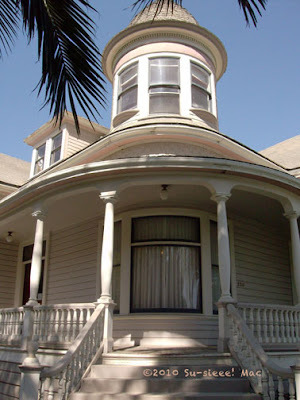 Mrs. Porter continued to reside at Monterey & 6th until her death in 1938. Here are some interesting notes about Mrs. Porter's life, which I found at the San Benito County Historical Museum. She was born Olive Pond in April 1860 in Placer County. She was well-educated, having attended the Napa Collegiate Institute, the College of Pharmacy in San Francisco, and the Women's College of Medicine in Philadelphia. The notes did not mention if she graduated from the last two schools. She and Dr. Porter married in 1881. How the Porters came to settle in Hollister is unknown. Did they come first or Olive's brother Hiram? While her husband was at medical school, Mrs. Porter took care of the business. 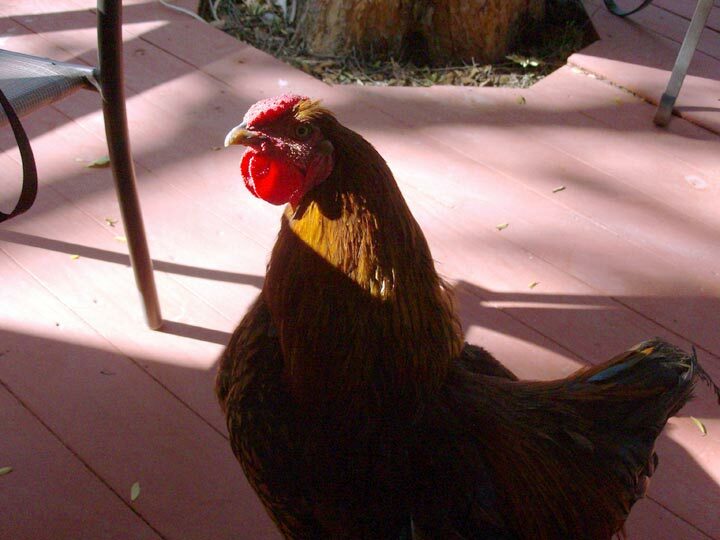 According to the family notes, Olive was the owner of a 500 acre ranch on Cienega Road. She was also a past Noble Grand Matron of the Rebeka Lodge in Hollister. There you go. Now you know a bit of who the Porters were at Sixth and Monterey a long time ago. Are you ready for a bedtime story for the whole family? You're in luck. Professional Storyteller Julie Engelhardt will be presenting another Story Time this Saturday evening, starting at 7 p.m. The theme: Pajama-Rama Party Story Time! 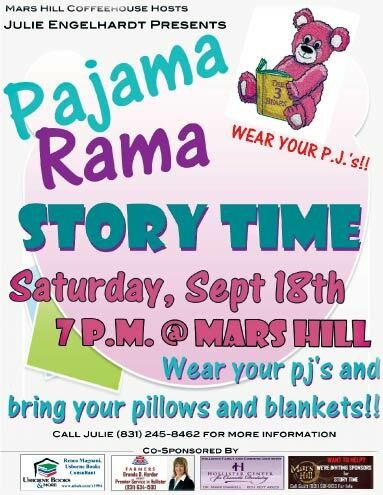 She invites all you kids—big and small—to come to the event dressed in your favorite PJ's. You can bring your blanky and/or pillow, too. The event is free! You can't beat that. Story Time will take place at Mars Hill Coffeehouse on the corner of San Benito Street and 6th Street. During the event, says Scott at Mars Hill, the coffeehouse will be offering customers a 10 percent discount. For more details about the event, call (831) 245-8463. 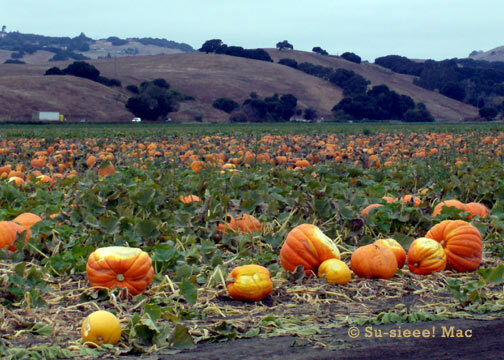 Tuesday in Hollister: Do You Know Where You Are? You're standing in a front yard. The house from which the photo was taken was built in the late 19th century. Forget about looking at the photo's file name. I misnamed it. I took this photo a couple of years ago, but the perspective is still the same. So, do you know where you are yet? Leave a comment here or at the Facebook page. Be sure to come back on Thursday to find out if you're right. By the way, here's what it looks like on the other side of all that darkness. Shop Locally: McKinnon Lumber Company—Happy 100th!!!! 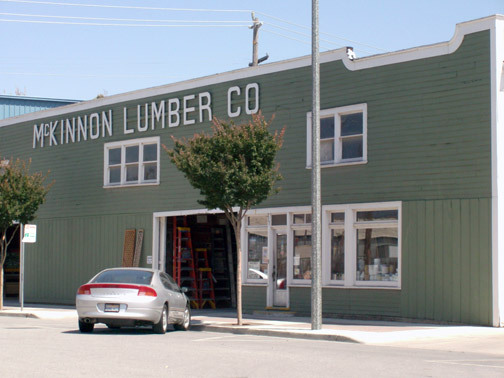 Today is the 100th anniversary of the official establishment of the McKinnon Lumber Company in downtown Hollister! Whoo-hoo!! Everyone now, up on your feet. This hardware store, which stands on the corner of 7th and East Streets, deserves a happy, vocal standing ovation from us for its dedicated service to our community. It is the last of its kind in town. Hope it stays on forever and a day! Do you have computers, televisions, cell phones, keyboards, and other unusable or unused electronics lying around the house because you don't know how to get rid of them? Do you know how to dispose of them properly but don't want to pay for it? Then this Saturday is your chance to get rid of your electronics for FREE in Hollister. The Accelerated Achievement Academy and Western Recycling is sponsoring a Free E-Waste Drop Off Day. You can bring your unwanted electronics to the Calaveras School parking lot at 1151 Buena Vista Road between 9 a.m. and 4 p.m. For more info, call (831) 634-4963. Answers to "Tuesday in Hollister"
Click here if you need to refresh your memory of this week's "Tuesday in Hollister" and click on back to this page. 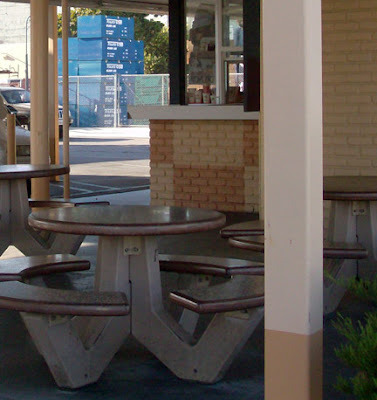 Okay, how many of you said A & W, which is on the corner of South and East Streets and up a bit from the tomato cannery (San Benito Foods)? Yep, I see a whole slew of hands in my magic mirror. No, sorry. I won't be distributing any yummy burgers at this time. But, how about a "Well done, dear readers!" Now, how many of you guessed the name of the establishment across the street from A & W? Good for you all! Here's a photo of the front entry for McKinnon Lumber on 7th Street. Did you know that it has been around since 1872, possibly even earlier? Tuesday in Hollister: Where Are You Standing? Let's say you're taking this photo. Where are you? What would you want to order? Hint: Down the street from where you're standing (as you take this photo) is another long-standing company. It spits forth a lot of steam and aroma 24/7 during the summer. Was this too easy for you? Okay, across the street is a pile of blue things. What establishment stores and sells those things? Come back on Thursday for the answers. The Farmers Market ends this month. High school Haybaler football games begin. Three concerts to check out at the Pepper Tree Ranch and two plays by El Teatro Campesiño to watch. 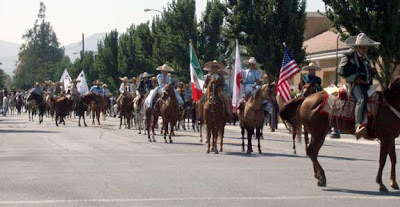 The annual Mexican Independence Parade in Hollister and the annual Chicken Festival in San Juan Bautista take place this month. 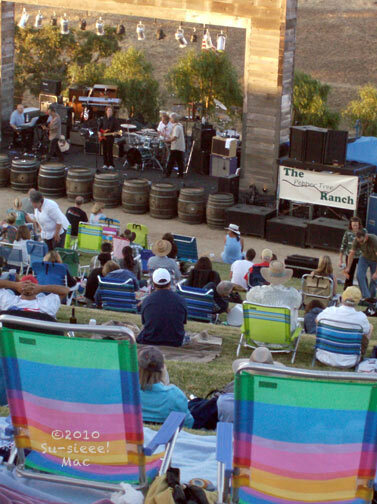 As do several yearly charity events such as the Kinship Center's wine and food tasting fundraiser at the Paicines Ranch. And so much more. 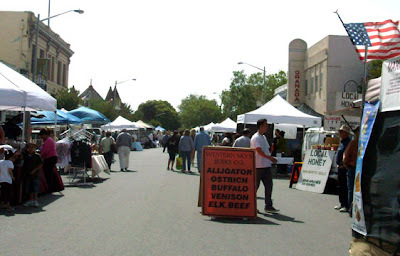 Sundays: Flea Market, Betabel Station and Outdoor Market, San Juan Bautista. 9 a.m. to 5 p.m.
September 1 to 29: Our Piece of Heaven Exhibit, featuring art works of Carole Belliveau, The Blak Sage Gallery of Fine Art (727 San Benito Street), Hollister. Gallery hours: Tuesday to Saturday, 1 to 5 p.m. Artist's reception on September 3, from 5 to 7 p.m.
September 4 and 11: Fremont Peak Observatory Evening Public Program, Fremont Peak State Park. September 10: Pedro Card Party, San Juan Bautista. Sponsored by the Native Daughters of the Golden West, it will be held at 203 Fourth Street from 6:30 to 8:30 p.m. Beginners are welcome. September 10: Open Mic Night, San Benito County Free Library, Hollister. September 3: Justine McBride and Second Wind Band Concert, Guerra Cellars Summer Concerts, Hollister. 6 to 10 p.m.
September 4: Hollister Professional Bull Riding, San Benito County Fairgrounds (Bolado Park). September 4, 5, and 6: Popl Vuh The Story of the Seven Macaw presented by El Teatro Campesino in San Juan Bautista. Different location location each day at 2 p.m. Free! 54th Annual Wine and Food Tasting, sponsored by the Gabilan Chapter of the Kinship Center, Paicines Ranch, 4 to 6:30 p.m. Tickets must be purchased in advance. The Shanks Concert, Guerra Cellars Summer Concerts, Hollister. 7 to 10 p.m.
September 12: Mexican Independence Day Parade, Hollister. September 16 to October 17: Corridos!, El Teatro Campesino, San Juan Bautista. September 16, 17, 23, 24: Hollister Haybalers Football Home Games, Andy Hardin Stadium. September 17 to 19: Civil War Days, San Benito County Historic Park, Tres Pinos. 12th Annual YMCA Charity Golf Tournament, San Juan Oaks. A Beatles Musical Tribute, The Vault, Hollister. Little Texas and Kelly McDonald Concert, Guerra Cellars Summer Concerts, Hollister. 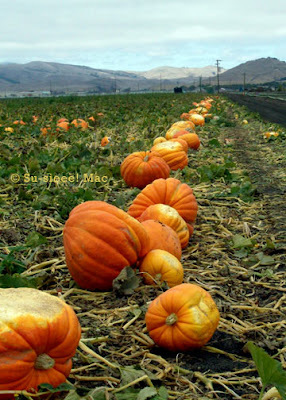 6 to 10 p.m.
September 18 to October 17 (weekends): Northern California Renaissance Faire, Casa de Fruta. September 24: "Vertigo," Movies in the Park series, San Juan Bautista State Historic Park. The movie will be shown on the San Juan Bautista State Historical Park Plaza Lawn at sunset. Refreshments will be available for sale. 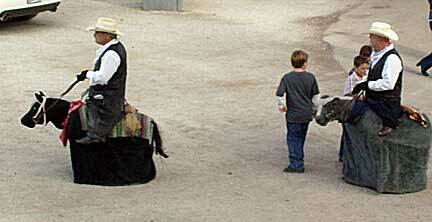 September 24 to 30: San Benito County Fair Horse Show Judging, San Benito County Fairgrounds (Bolado Park).